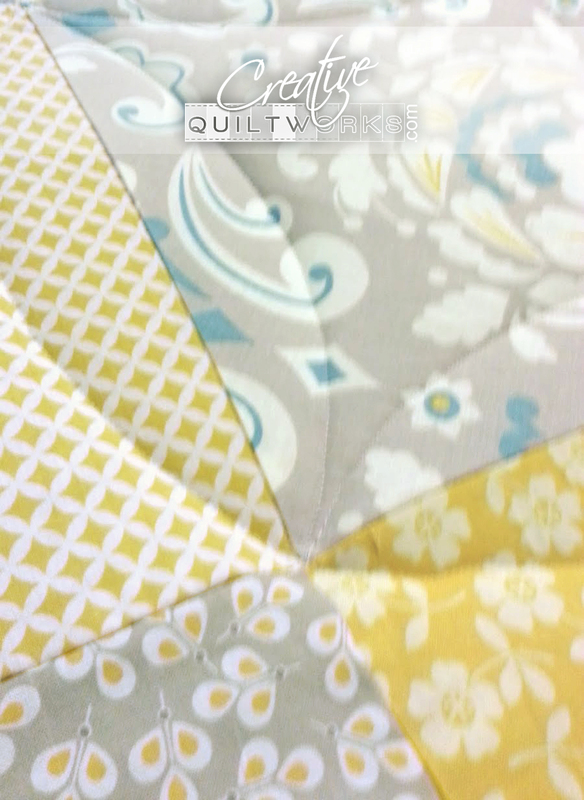 I am going to be teaching at a Quilt Show! at the Small Town Quilt Show - In A Big Town Way on Thursday, June 26 from 2:00p.m. to 5:00p.m. at the Zermatt Resort in Midway Utah. I hope you can join me! I am so excited as this is my first opportunity to teach one of our patterns at a quit show. I'll post more information about how to register for classes when that information becomes available. So, save the date! This is going to be so much fun!!! This is our very own "Modern Chevrons" quilt pattern we will be teaching at the show. 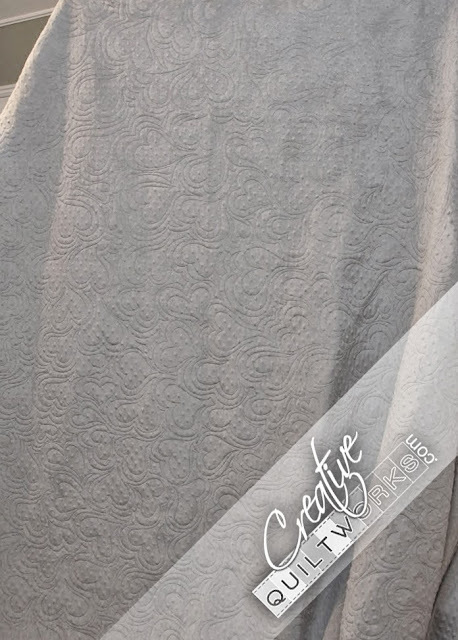 It is designed by my sister, Cindy Davis! 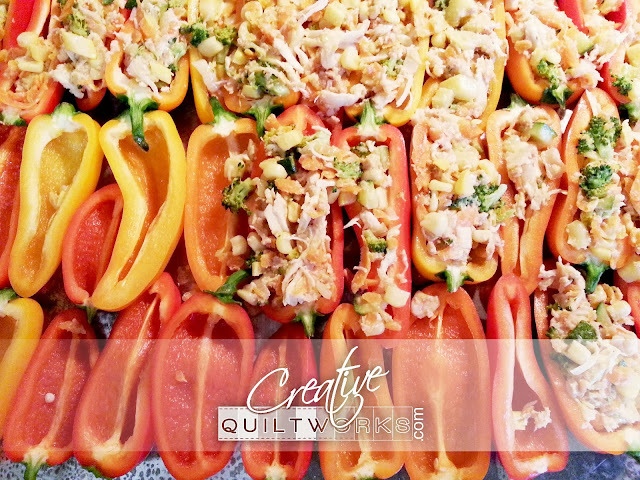 Jen made these delicious stuffed peppers for Ari's baby shower. 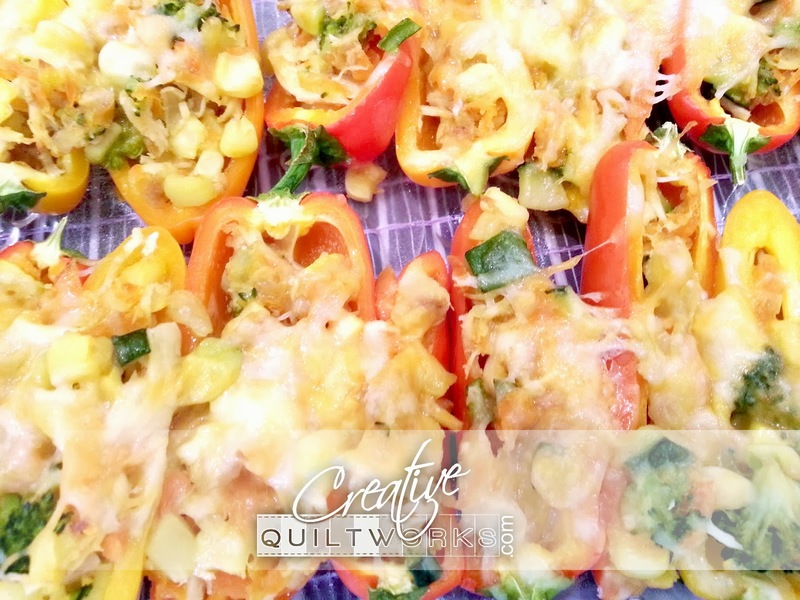 They are a crowd pleaser and so nutritious! This recipe will feed a crowd! Saute onion until just browned, and cook the rest of the veggies just long enough, so they are still crisp. 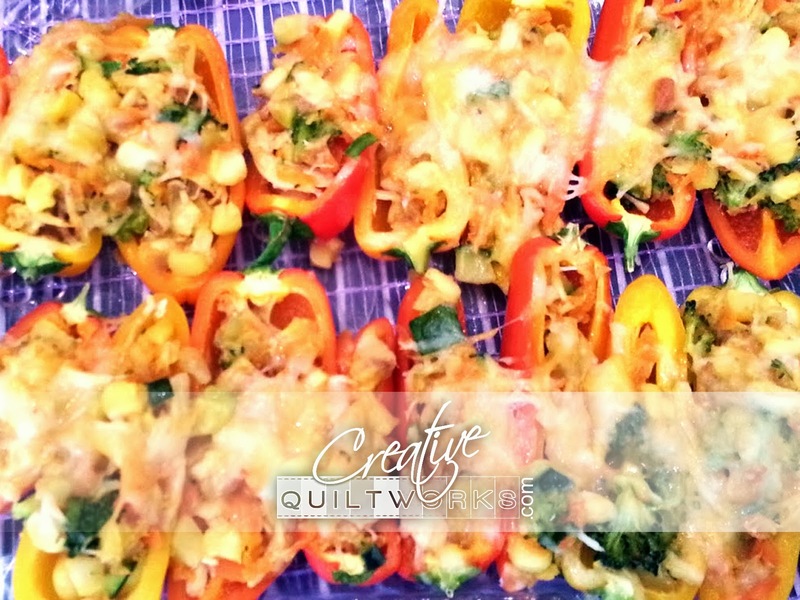 Wash and cut in half lengthwise, I left the stems on - they made little handles and looked colorful. 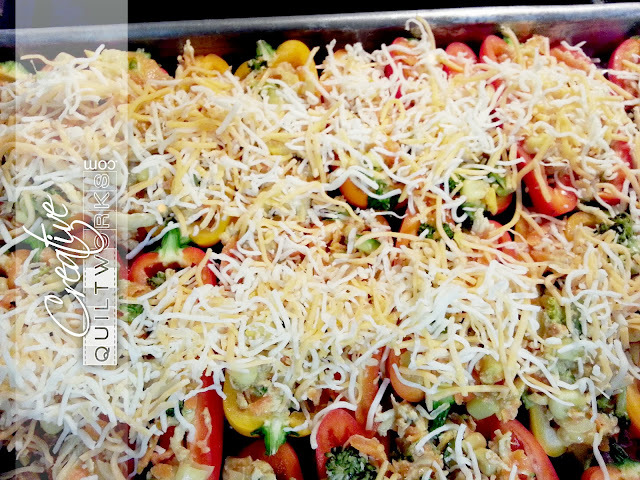 Pop it in the oven at 450 degrees for 20 minutes or until the cheese is bubbly and Serve! 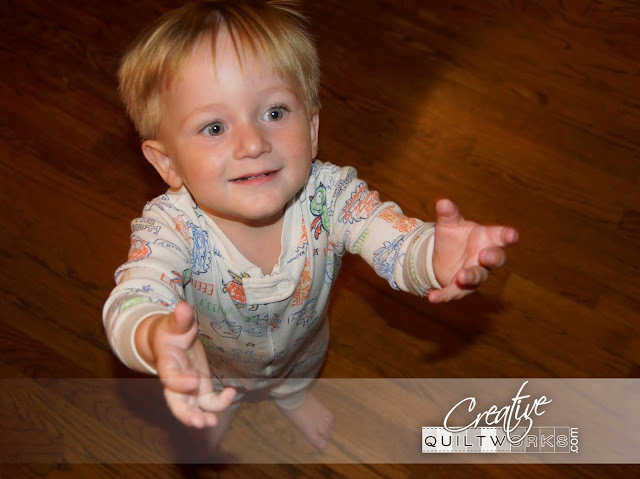 You will have people, like baby K, asking for "more please!" 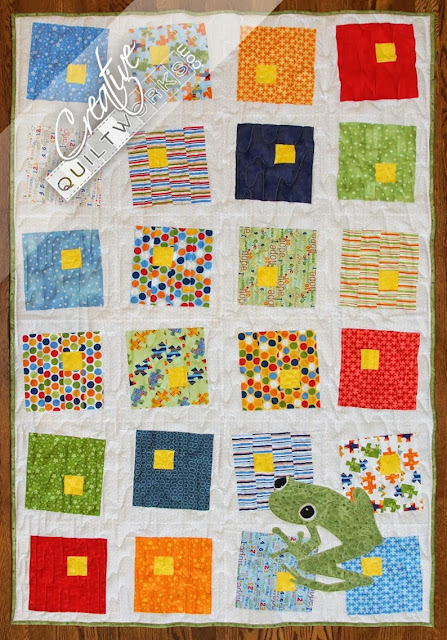 The "Hop To It" quilt is done! 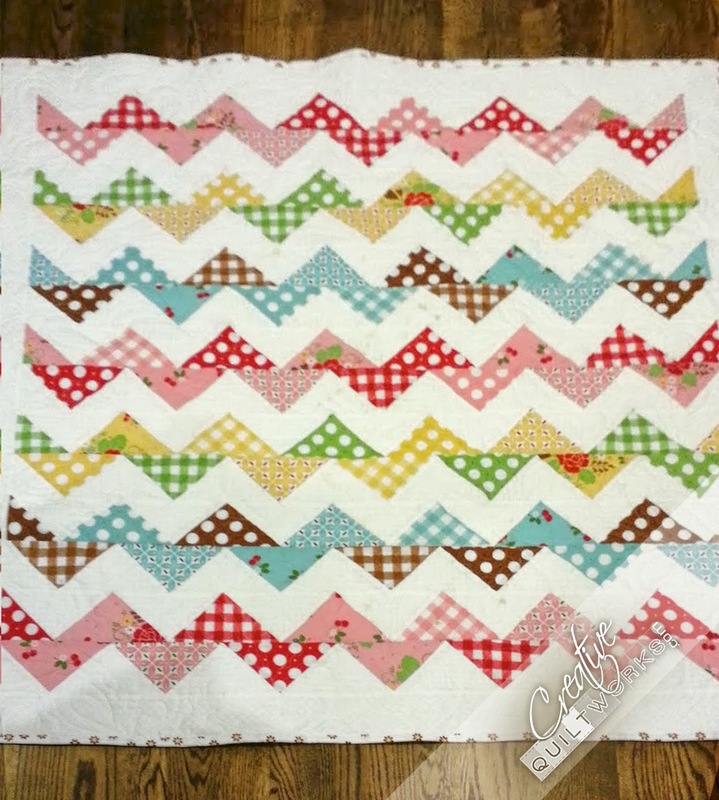 A while back I created this cute little quilt and I've kept you updated on its progress. Click here to see it in different phases. I am happy to say that, finally, it is finished! And I love how it turned out. 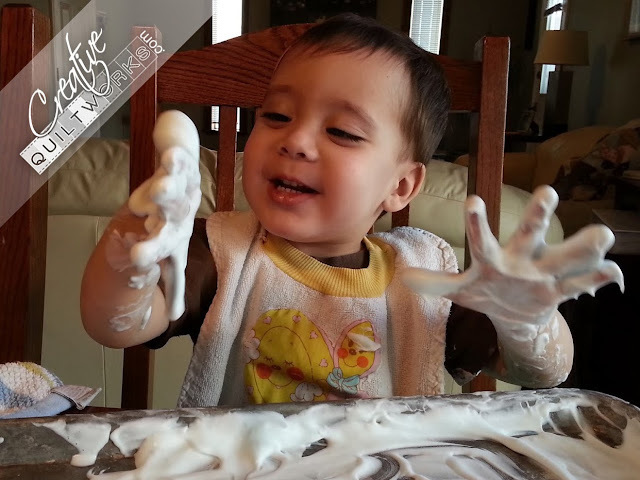 It is so cheerful and fun, and I love the movement of the stack and whack blocks. 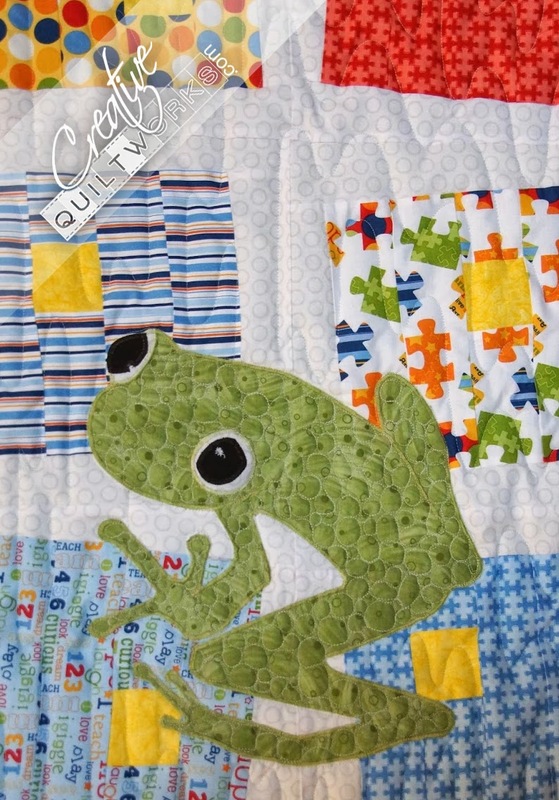 Here is a closeup of the little frog applique. He was drawn by my daughter Ari and I think he looks ready to jump! I think the blocks are like lily pads. 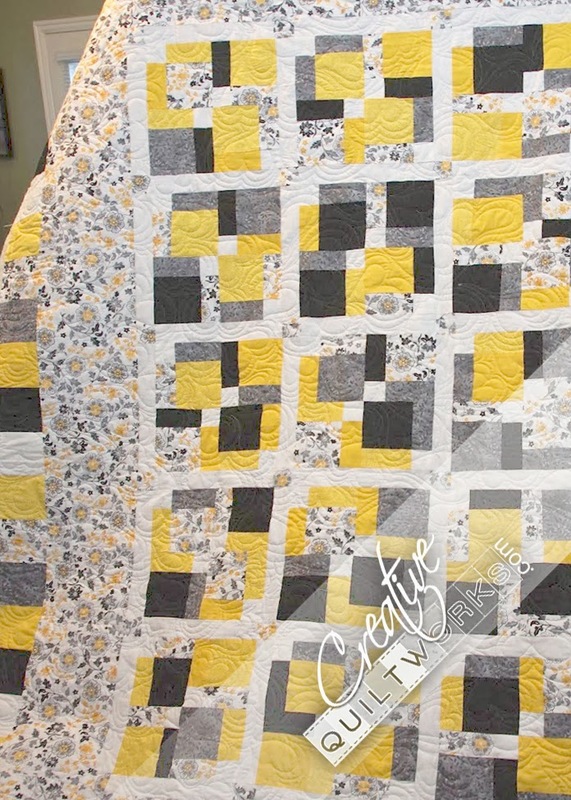 I am happy with this quilt! Connie Hoffmeier sent me this quilt all the way from Maryland. It is so beautiful and lively! And the colors are so current! I love the allover heart meander! Yes we can do Minky! 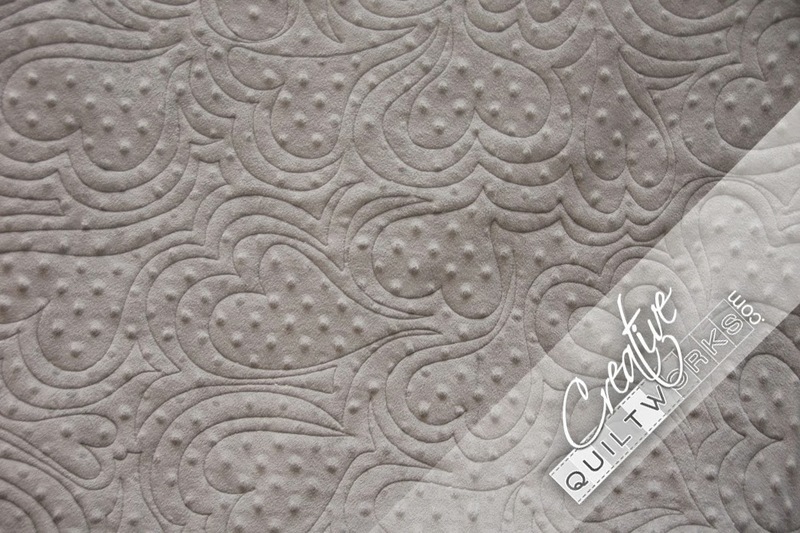 I love the texture the quilting adds to this quilt. 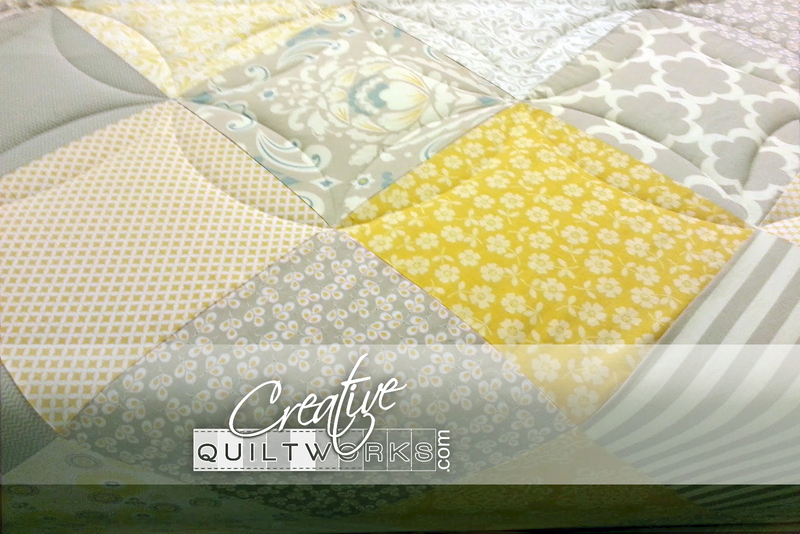 Thank you Connie for letting me quilt your beautiful quilt! 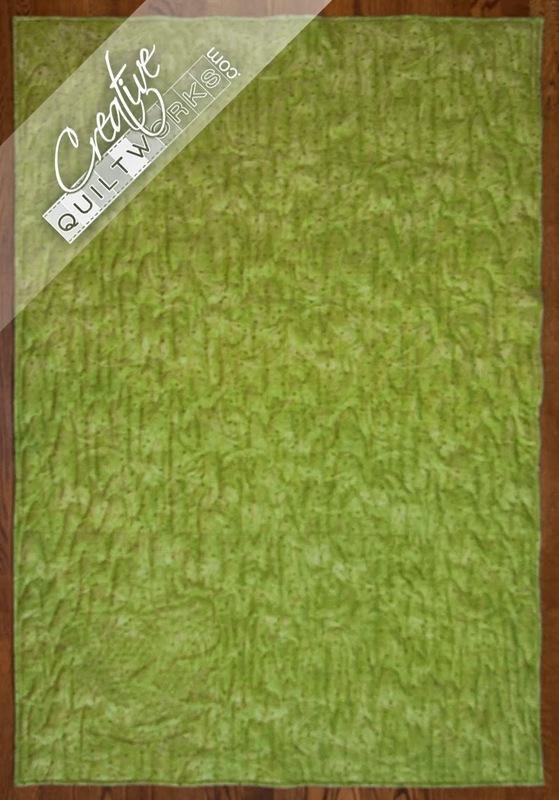 Here is another great way to "Save Time and Money so You Can Have More Time and Money to Quilt!" 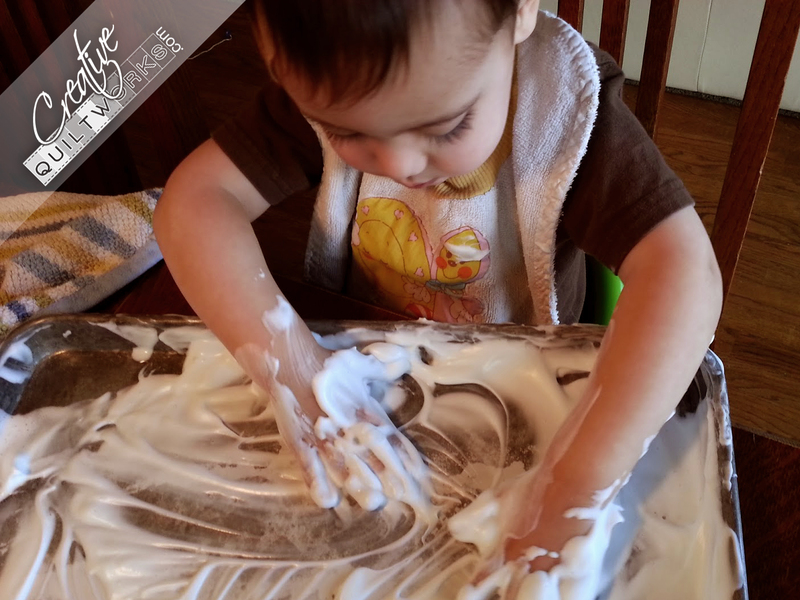 So while you are in the kitchen, cutting out fabric for your next quilt, he is at the table painting with shaving cream for soo long! Everyone is safe and happy! Just get a cookie sheet a little damp, put a squirt of inexpensive shaving cream on it and let your little one go to town. 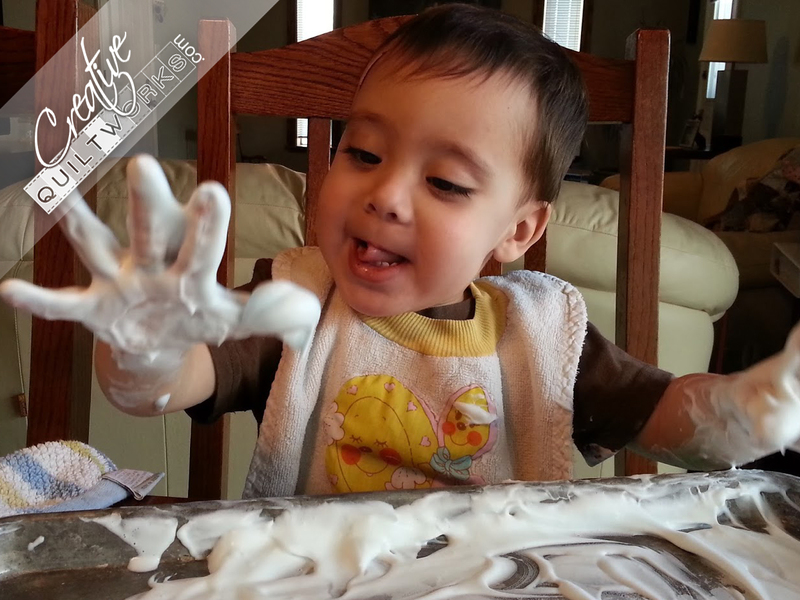 Clean up is easy, it is just soap! So rinse well and put on dry clothes. I just had to share another picture of our little granddaughter and her mommie. She looks so cute in this peachy pink! 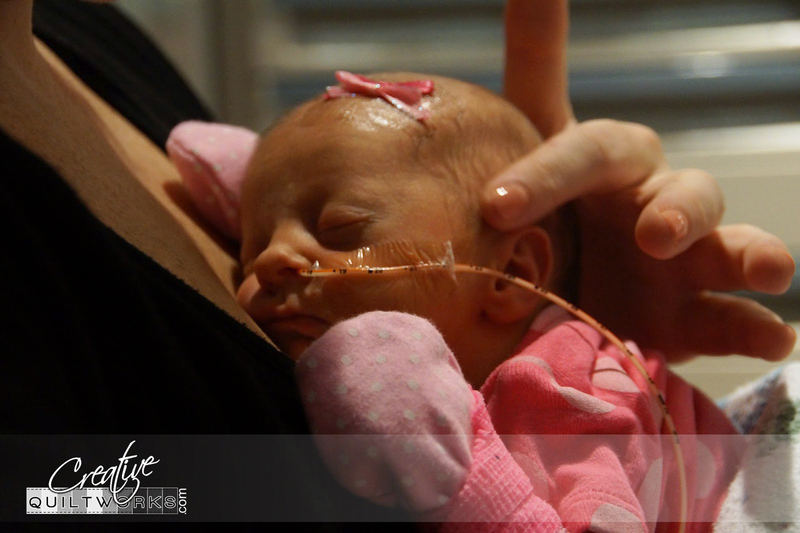 We are so grateful for her safe arrival and how well she is doing! She has such loving parents! I wanted to try my hand at making a large cosmetic bag with these orphan blocks. They are left over from a quilt I made some time ago. 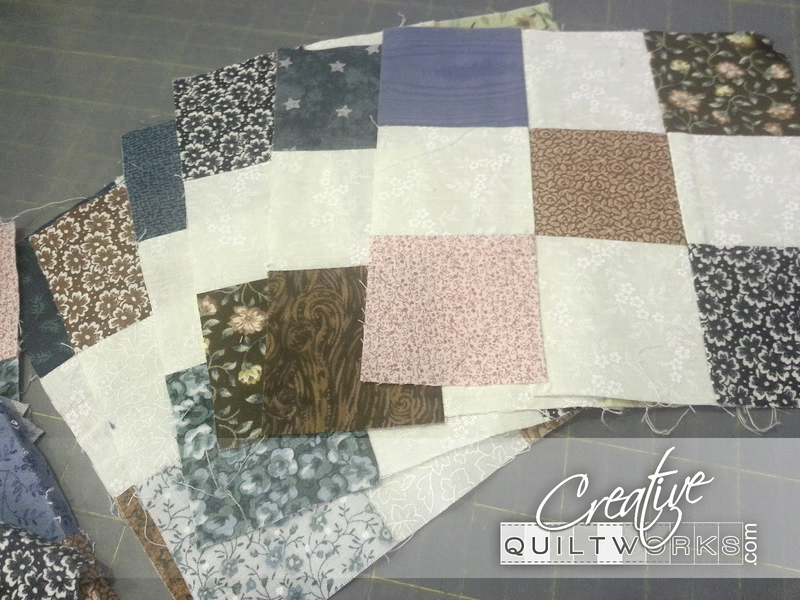 They are simple 9 patch blocks and I had a few squares left over from making the quilt. 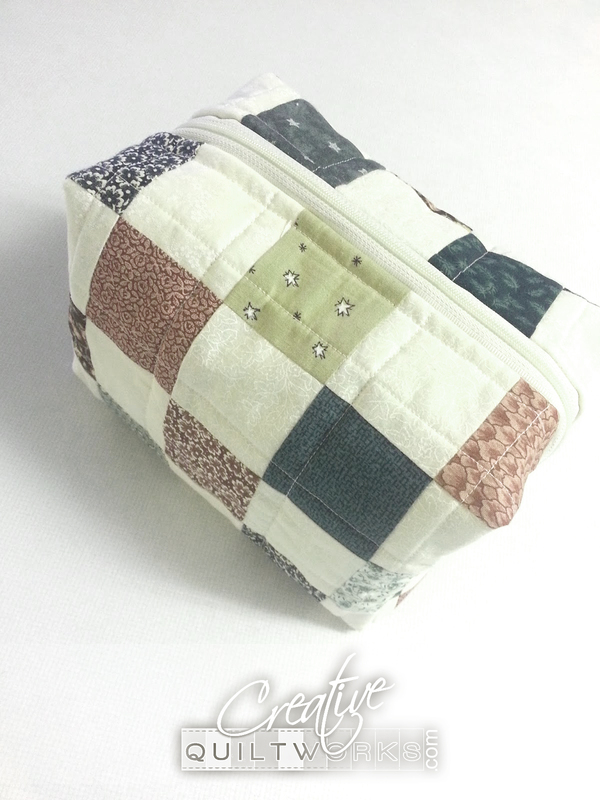 I found this tutorial online at Sew like my Mom.com and liked the bag so, I used her instructions with the following changes: I substituted orphan blocks for one of the fat quarters and I did not use the vinyl. The vinyl is great but I did not have any on hand. 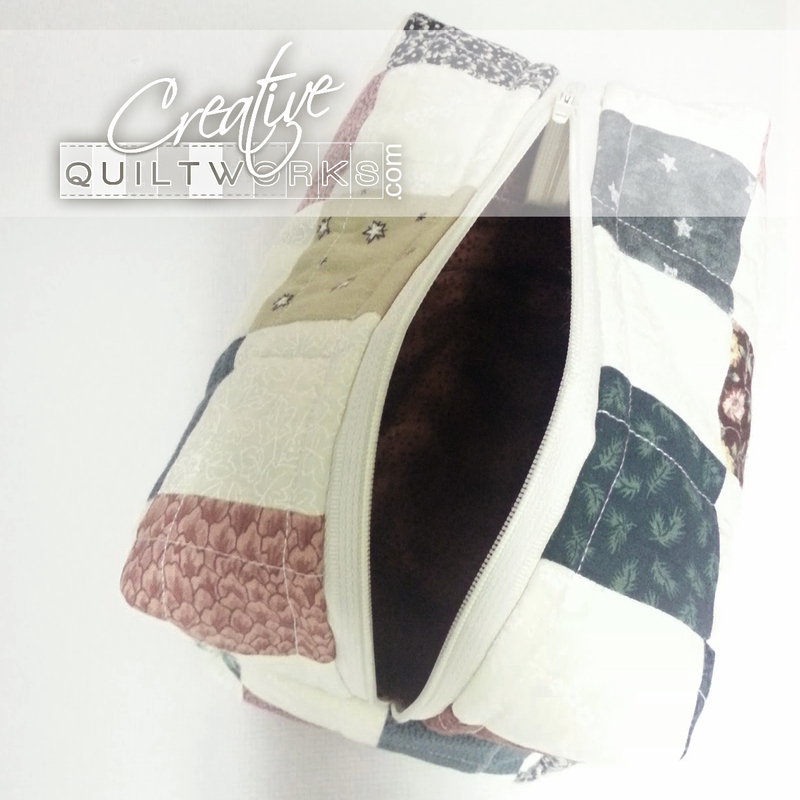 This is a very roomy bag and so nice! Baby M is here! She is early, but she is perfect! Mama and baby are recovering quickly. 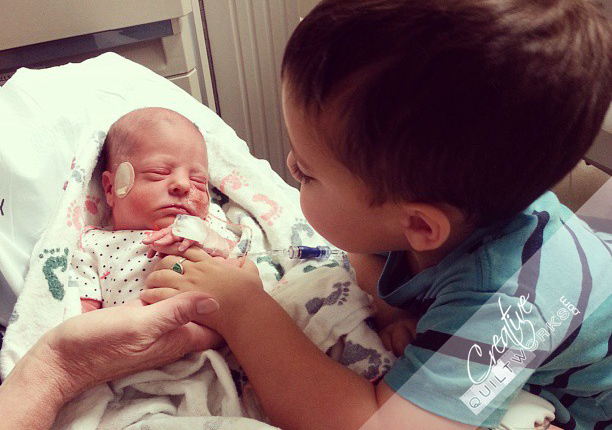 Big brother, H, is so sweet to her! She is my first Granddaughter and I couldn't be happier! It has been a whirlwind of activity this week with family and friends traveling from far to meet her. So, a while back I posted a picture of my niece Kim and her quilt. I was looking at photos and found a few more that show off how cute this quilt is and so, I am sharing them! I hope you don't mind too much! This is one of Kim's first quilts and she got amazing results from a simple pattern. 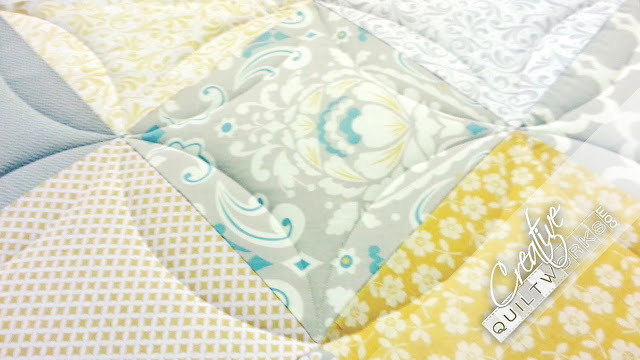 I was so impressed with her quilting! 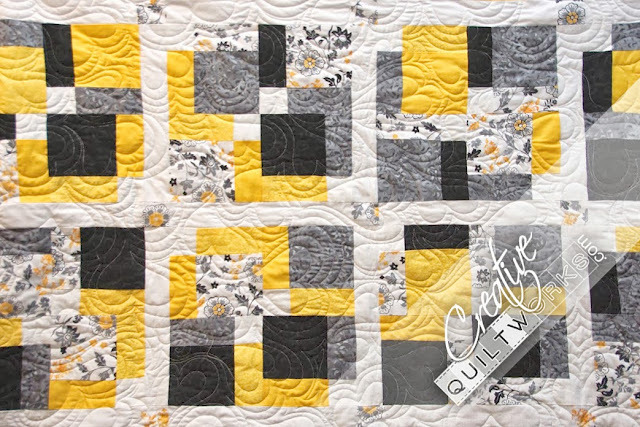 She used a ruler to form the curves and it created such dimension to the quilt. Thanks Kim for coming to visit me in my Studio!